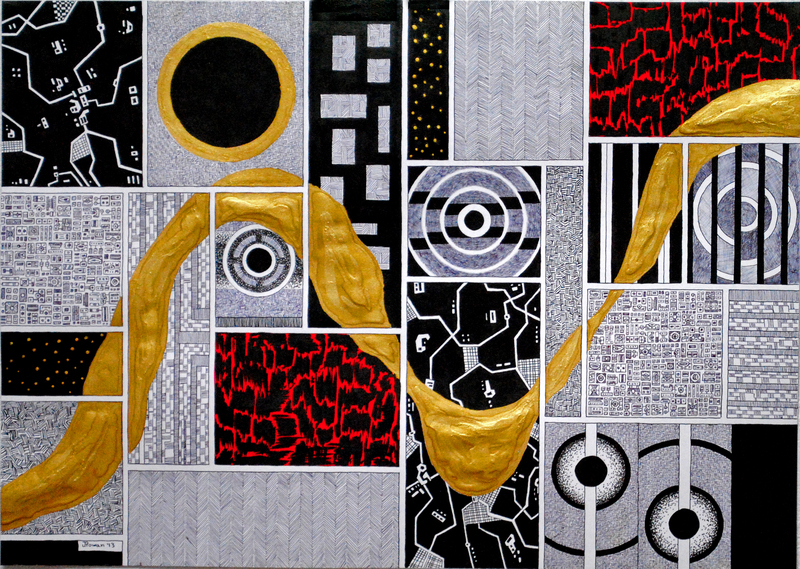 This is a visual adaptation of a poem I wrote. 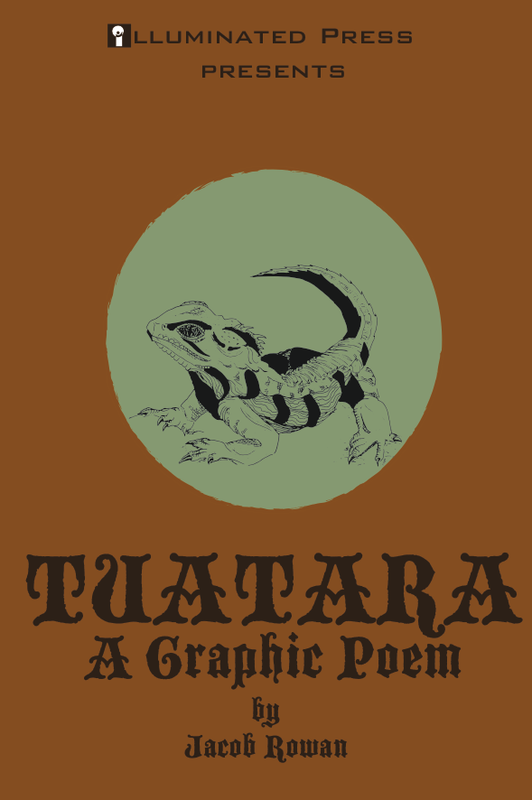 It fuses images from Ecclesiastes with a fictional narrative of a near extinct creature found in New Zealand. I used Adobe Illustrator to digitally color hand-drawn images. 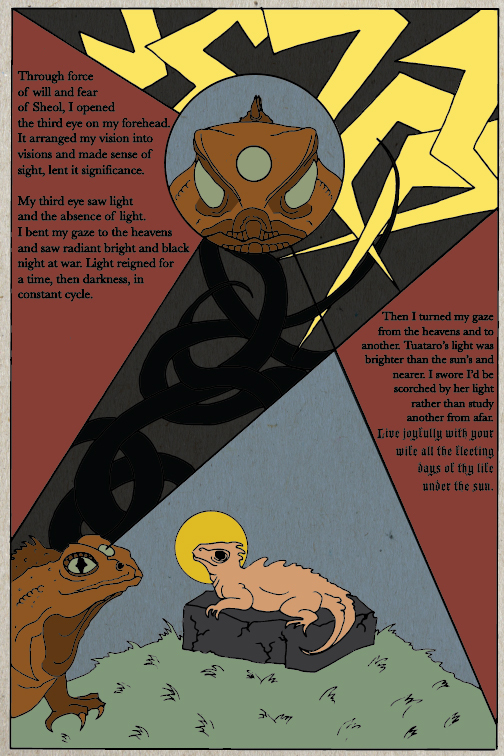 I used what I learned making the digital illuminations for Eliot’s “Preludes” to update this project with some texture and variety. You can download the complete PDF for free here. In the tradition of Matt Kish, another great illuminated classic has been created by Allen Crawford. 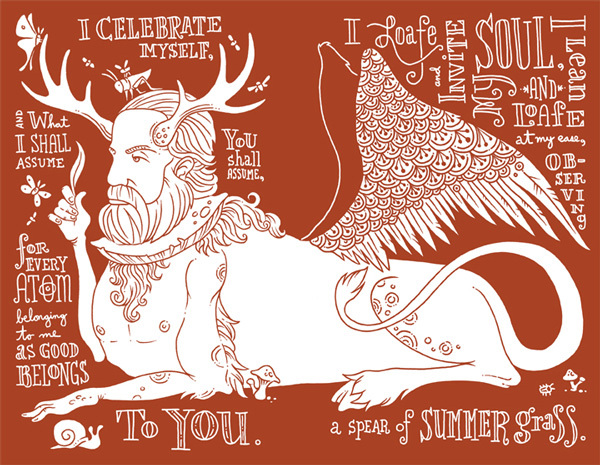 Whitman’s collection Leaves of Grass, with Song of Myself as a centerpiece, is a keystone of American poetry, and Crawford uses drawings and hand-lettering to deepen the reader’s experience of the poem. 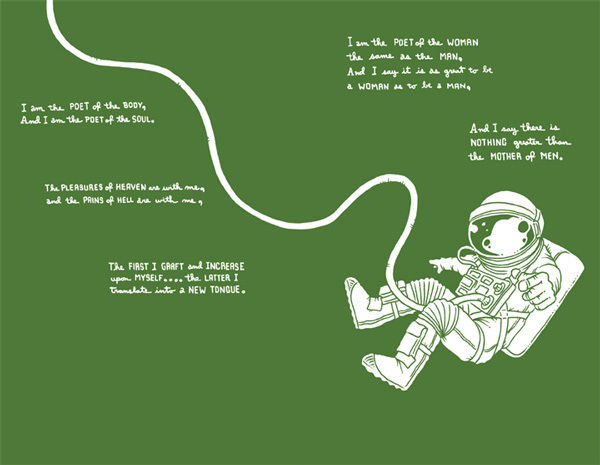 Looking at the first page gives you a sense of the whimsical humor that pervades the book. 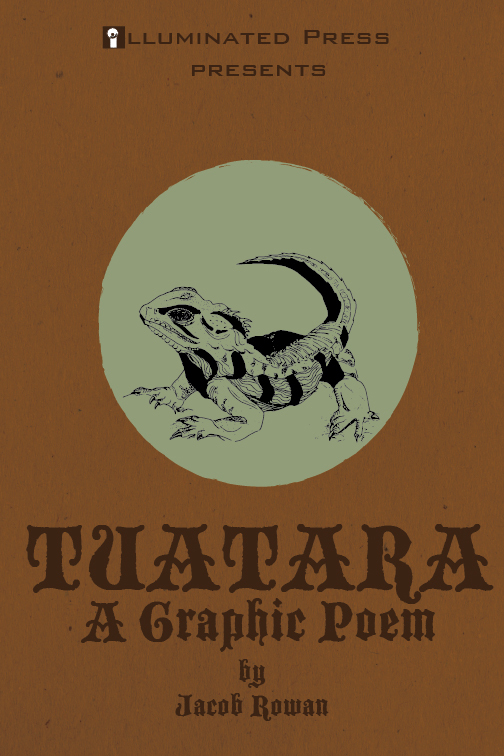 Each page is a hand-drawn spread created mostly through a process of improvisation rather than of careful planning, a method of which Whitman no doubt would have approved. 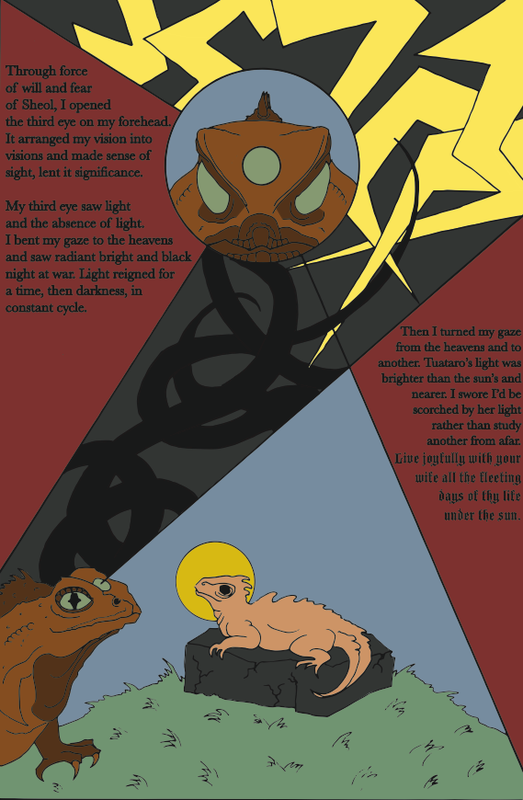 Some pages are nothing but elaborate compositions of text, while others are images floating in empty space with a few lines of verse. Most are a pleasing combination of both. Trying to read a page like this slows you down enough for the individual lines to really sink in. Several reviews I’ve read say that this copy is not the best introduction to Whitman since some of the pages are difficult to read. I have only skimmed the original, but I would have to disagree. Whitman wanted to break free of the traditional bonds of form in poetry. He wrote sprawling verses that are hard to follow even in traditionally printed books, since artificial line breaks must be added to make Whitman’s free verse fit into the standard paperback format. Crawford makes Whitman’s dream of breaking free from poetry’s form a reality. While it is almost impossible to read the page above in the exact order Whitman wrote it, it is just as impossible to miss the experience of the verse when seen in this way. 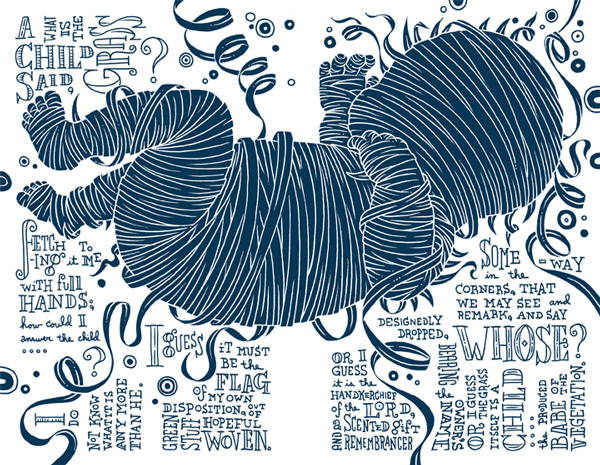 The drawing, the floating text that forces you to turn the book around in your hands as you read, surely get at the heart of Whitman’s cosmic scale and intimate verse. I believe Whitman was seeking after the experience created by the reading of his poetry rather than the dogmatic adherence to his choices in form, line length, and word order. Some pages are harder to decipher than others, though I wonder how much that has to do with some obscurity in Whitman’s poetic language and how much it is a failing on Crawford’s part to create a flow through the text. No doubt repeated readings would make such pages more clear (and re-reading is a necessary reality of reading any kind of poetry). Crawford does have a lyrical sense of how to arrange words so that at first glance the page seems illegible, but once the reader dives in he is carried through with a sense of excitement and engagement rather than confusion or frustration. This illuminated manuscript does what all beautifully bound and illustrated books should, it forces the reader to understand that he is not superior to the book. This is a book to be experienced, not marked up and analyzed. To read this copy of Song of Myself is to more fully enter Whitman’s world, to more holistically experience the scope and intimacy of his poem. 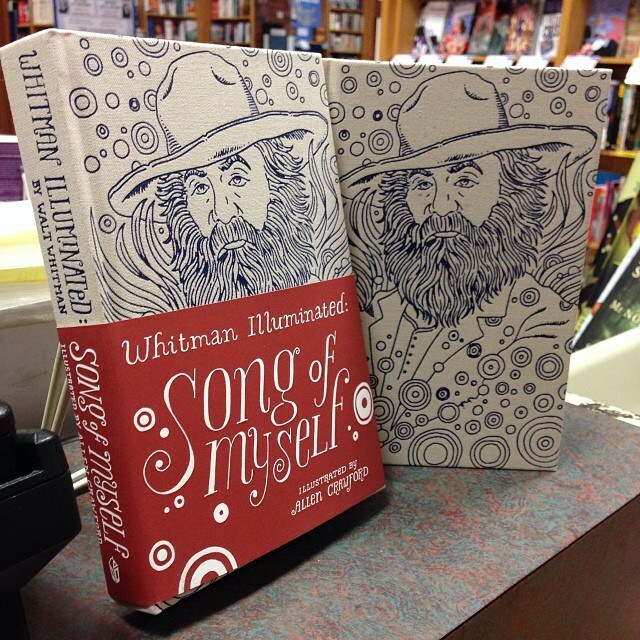 You can find Whitman Illuminated: Song of Myself illustrated by Allen Crawford on Amazon or at your local bookstore. Here’s a link to the full comic. Enjoy!